Frost Bank’s logo will now appear on the Spurs’ jerseys. The San Antonio Spurs have their first sponsored jersey in franchise history, and that comes from none other than locally-founded Frost Bank. 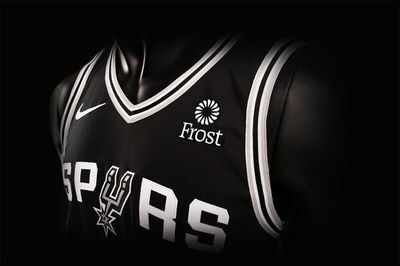 Beginning in the 2018-19 season, the Spurs jersey will feature Frost’s signature sunburst logo on the left breast as the two iconic Texas brands celebrate more than 45 years as partners. The jerseys will be unveiled prior to the start of the season and debuted on the court when the Spurs host the Miami Heat on Sept. 30 in the first game of the 2018 preseason. Frost Bank and the Spurs first joined forces in 1973 when Tom C. Frost provided the financing necessary to move the franchise to San Antonio. Throughout the 45-year relationship, Spurs Sports & Entertainment has also relied on Frost as its longest-tenured partner and bank. Headquartered in San Antonio, Frost Bank is a Texas institution focused on integrity, caring, and excellence. Since 2010 Frost annually has received the highest ranking in customer satisfaction in Texas in J.D. Power’s U.S. Retail Banking Satisfaction Study. Frost is also a 29-time recipient of the Greenwich & Associates Excellence Awards for Middle Market and Small Business Banking. The NBA first started allowing sponsor patches on their jerseys in 2017. 20 teams featured them last season.